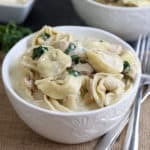 Instant Pot Tortellini Alfredo is a rich and delicious pasta recipe with bacon, chicken, spinach and a homemade Alfredo sauce. Kid-friendly and wonderful to use as leftovers, this dish is made in one pot which cuts down on prep and cook time, and makes cleanup a breeze! Add in the heavy cream, pepper and the tortellini. Then place the cubed chicken on top. When the cook time is complete feel free to use the quick release of the pressure and lift the lid when safe to do so.